PulseTV.com's Customer Service is here to help! Hours: Monday - Friday, 8 a.m. - 5 p.m. CST. We work hard to make the ordering process as easy as possible! You will get an Order Confirmation Email when it has been received. Be sure to check your spam or junk folder if you don't see it. Add the items you would like to purchase into your shopping cart and follow the instructions. We accept all major credit cards and PayPal. We accept credit card orders by telephone at 800-711-1361 24 hours a day, 7 days a week. Have your item numbers ready for the products you'd like to order. Note: We cannot process PayPal orders over the phone. U.S. Residents can send us an order using a personal check or money order. Add the items into your shopping cart and proceed to checkout, then follow the instructions for check by mail. You'll need a connected printer to print out your order form to send to us along with the check. All orders are processed upon physical receipt of your payment. However, check orders and money orders are held for bank clearance for 10 days. So to avoid any delays for fund clearance and/or inventory levels, we recommend you purchase your order via credit card instead. 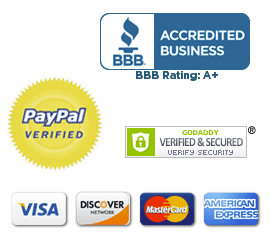 We accept all four major credit cards, PayPal (online orders only), and check by mail. To use an in-store credit online, you must be a registered customer. If you do not wish to register, you can use an existing in-store credit by calling in your order with Customer Service and mention that you have a credit you'd like to use. Your credit will never expire. If you notice a mistake on your order, please contact us as soon as possible. Since it is our goal to ship your order within one business day, we cannot guarantee a correction once your order is processed. If your order is incomplete, incorrect, or damaged upon receipt, please contact us as soon as possible. Most orders will ship within 1-2 business days, provided that the items are in stock. You will receive a Shipping Confirmation Email when your order is on its way. Please note that all payments are in U.S. funds only. Our Shipping and Handling costs do not include any additional Customs and/or Duties that may be charged by your local government. Please check local laws and limitations where applicable before making your ordering decision. Unfortunately, there are a few countries we are currently unable to ship to outside the U.S. due to a history of either high credit card fraud or poor postal delivery results. Shipping charges are based on the total weight of your order. Included is a standard $2.00 handling fee for the entire order. You can estimate your S&H in the cart by clicking "Estimate Shipping" button once you have items in your cart. Online - Registered Customers can track their order online by logging into their account and clicking "View Your Order History". Email - We will send you an email once your order leaves our warehouse and we receive tracking information from our shipping partner. Contact Us - Customers that use Guest Checkout or did not receive a tracking notification should contact customer service to find their tracking number. If you are not 100% satisfied with your PulseTV purchase, return it within 60 days for a replacement, store credit, or refund of your purchase price (less S&H). When you shop with us, we want you to be completely satisfied too! So contact us with any questions or comments, and we'll make it right! If your item is not working as expected, please visit our site first for any required special product instructions. We constantly update our product pages, please be sure to search for the product you are having difficulty with and see if there is anything new we may have published to help you with your product. Sometimes the problem is as simple as removing a plastic disc to activate the battery in a flashlight! Search for your product on our site, read the description, watch the video, read the FAQs, or check our uploaded product manuals. If we no longer carry the item, we maintain a database of old manuals here. If for any reason you are not satisfied with your purchase, return it within 60 days for an exchange or a refund for the purchase price of products only (less shipping and handling). Components and retail packaging must be returned as received. Refund checks are not available for gift returns. Customers are welcome to return products to PulseTV within 60 days receipt for any reason. To start your return, please select the reason below. Simply complete a Return Form with your instructions for each item enclosed. Package and ship your return to this address using the carrier of your choice (we recommend saving your tracking number). Confirmation will be emailed to you as soon as your return has been processed, typically allow 1-2 weeks.